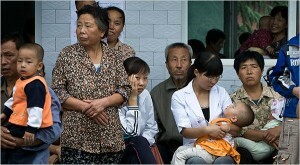 SUNJIANANTOU, China, Aug 21 (Reuters) - Every parent in the village of Sunjianantou knows exactly how much lead is in their child's blood, after 800 children living near a lead smelter in Shaanxi province tested positive for lead poisoning this month. "Please tell us, can the lead ever go away or not?" asked the mother of 8-year old Pengfei, whose test results of 249 micrograms per litre explain how an active small boy slowly turned wan and listless. "We get our water from our family well. We have no idea if it is safe enough, or what to do about food. The government isn't testing adults, so we don't even know if we are poisoned too." "Mass incidents" -- or riots and protests -- sparked by environmental problems have been rising at a rate of 30 percent per year, according to China's environmental protection minister, Zhou Shengxian. "When a problem bursts out in the media, the government suddenly 'solves' it," said Zhang Jingjing, a lawyer with the Centre for Legal Assistance to Pollution Victims. "But that's usually not a good result, it's just a way to make the problem go away. But their most important question -- whether the smelter will be permanently shut -- remains unanswered, a week before classes are due to start at the small grammar school next door. The Dongling Group is one of China's 500 top companies, according to a banner on its plant, and the 100,000-tonne smelter built two years ago is supposed to meet China's drive for larger, and supposedly safer, plants to replace the smaller, and even more polluting, predecessors. "We've asked for testing but they said no," said another mother, whose two children both tested at over 200 micrograms per litre.